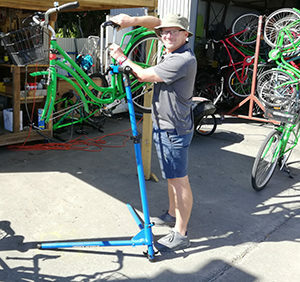 Martinborough now has a resident bicycle mechanic! Emily and Alex Clark along with baby daughter Celeste and Alex’s 10-year-old son Jasper recently chose Martinborough as their new home town, and are now planning a new build just out of town. It just so happens Alex is a fully trained bicycle mechanic, so, when he popped into the Green Jersey bike shed to see if there was any work, he was greeted with “open arms”. Whilst the Green Jersey fleet keep Alex busy, he is also available to service our local’s bikes. Local biker David Blake is a regular visitor, both for technical advice, a chat and bike maintenance and parts. David said “it’s a great step up for the town to have our own resident bike mechanic, we all need to support this service and make it permanent”.